The classic is a more minimal approach to barefooting. The open design is low cut on the foot and has an adjustable elastic ripcord to ensure a snug fit. The sole is non-marking and razor-siped to provide slip resistance in a variety of environments. IF YOUR SIZE DOES NOT APPEAR IN THE DROP BOX AND WOULD LIKE TO BE PUT ON THE WAITING LIST PLEASE CALL 1-877-771-9255. 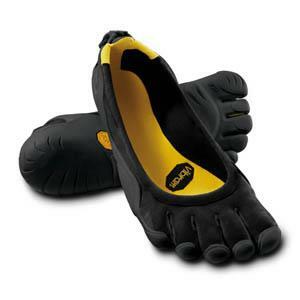 All Vibram FiveFingers are MACHINE WASHABLE and AIR DRY. Upper is produced with a thin, abrasion resistant stretch polyamide fabric sits low on the foot-for comfort and quick drying. Polyamide provides 30% stretch and allows FiveFingers to accommodate foot widths A-4E. Elastic Gore and pull tab make the FiveFingers easy to secure. Aegis Microbe Shield _ protects the sockliner to control odor, staining, and deterioration. Machine Washable. Use gentle cold water cycle with liquid or powder detergent. Please hang to drip dry.